As I throw around ideas for Dogwood City and some other mini-projects, I've hit upon a thought that must have been explored in the OSR community at some point. I wonder why we don't see more game rules with values simply noted in numbers of dice. By that, I mean...wouldn't it be easy to write up a monster, or a character class, or whatever, with generic Hit Dice and Damage Dice, and the understanding that if you're playing White Box, you should use d6's...Basic games use d8's...maybe 5th edition uses 10hp/die...etc.? The value of OSR material is raised so much by the quick-conversion-on-the-fly potential, and it doesn't seem like it would be too difficult to fashion a standard presentation method that wouldn't require any conversion beyond filling in a die type. 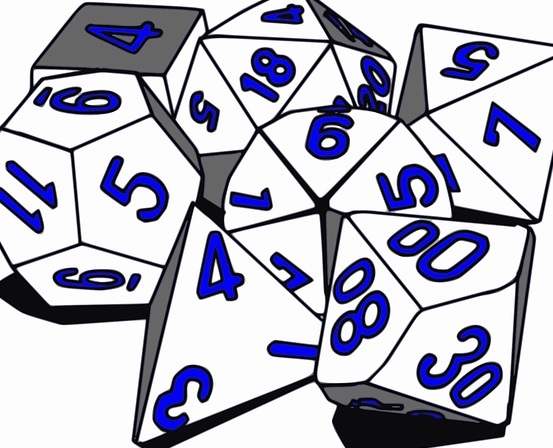 It can even apply to situations where rolling for hits/damage is removed from the equation, simplifying things for miniatures or card games by working with smaller numbers. Maybe this is used more than I realize...? I could be overlooking a trend, or an unspoken understanding that I've just been too dense to realize and articulate until now. At any rate, it's changing the way I'll be approaching presentation of icosahedral RPG rules going forward.